The beautiful French word "décolleté" means a low neckline on a woman's dress or top. It's also used to refer the area of the neck, upper chest and cleavage. There's one part of the body which is almost always neglected skincare-wise! In my practice I often see women with smooth and well taken care of faces and wrinkly, sun damaged décolletage areas. The reason being, most people don't apply any products there and that part of the skin gets just as much environmental exposure as our faces. For the most part, neck and décolleté skin is more sensitive than facial skin. When you choose a skin care regimen that needs to be taken into consideration, to avoid irritating and drying out your skin, which will create the opposite effect of what we are looking for. Wash with a gentle cleanser. Every time you cleanse your face, you should be including your neck and décolleté . You can use soft sponges and washcloths with your cleanser to avoid mess on your shirts. If you're in the shower you can use your regular body wash and a loofah, but avoid harsh scrubbing. Use a toner that has hydrating and anti-aging properties. You should be looking for ingredients such as antioxidants, hyaluronic acid, Vit B5, CoQ10 etc. Serum is a key! Décolletage skin has smaller pores, as oil glands in that area are not as active. Thats why skin there is usually drier that the face. Therefore you need a serum because 1) it has smaller molecules to penetrate pores easier 2) it can provide extra hydration, due to higher ingredient concentration. You need to be looking for water binders such as hyaluronic acid, alpha lipoid acid, CoQ10, Vit B5 and Vit E. Another group we need in our serum is antioxidants - Vit C and E, berry and citrus extracts, beta-carotene etc. These magic molecules attach to the free radicals that damage our skin and deactivate them, thus rejuvenating skin appearance. Correctives should be used 2-3 times a week if you already have signs of aging and sun damage. Best to use is a low concentration /1% or lower/ of Retinol in a moisturizer form, combined with brighteners like hydroquinone, arbutin, kojic and azelaic acids. I personally have found AHA's to be too harsh to use in that area. However if your skin is thicker and tolerates it, then you can use that instead of retinol. Protection is a must ! Regardless of the season, sunscreen is essential. Use SPF 15 or more every morning and reapply as needed. This is so important that I ended up creating an SPF spray to make the process easier and to promote regular use. Of course lotions are great too, but I found sprays don't create an oily look or leave white residue when layered with other products. They are also easier to spritz on throughout the day, especially if you are wearing make up. We hear about micro-needling more and more lately. A lot of my customers ask me what it is and how it can help them. So even though as of now we do not perform it in the studio, I decided to write a blog entry about it to shine a little more light on the subject. 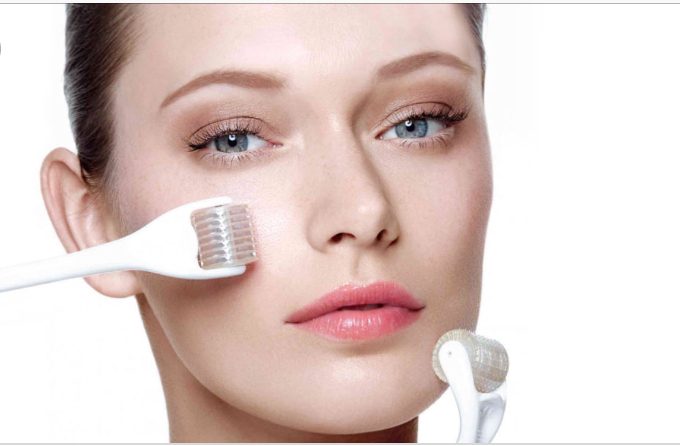 Micro-needling is also known as collagen induction therapy or CIT. It is a procedure used to create a controlled wound response and thus improve the appearance of the skin. It is most commonly used for fine lines, wrinkles, acne scarring, stretch marks and non-inflamed rosacea. So basically tiny needles are used to puncture your skin, which stimulates the production of more platelets and white blood cells. That causes the skin to go into healing mode and discard damaged skin cells, while producing new ones with lots of collagen. The procedure also forms micro channels through the epidermis that allow topical products to penetrate more effectively. Terri Wojak uses a very good comparison in her book "Aesthetics Exposed" - She says micro-needling is like aerating a lawn, whereby puncturing holes into the ground provides pathways for fertilizer to enter. It's very important to apply lots of moisturizing and antioxidant agents following the procedure to help skin heal faster. Micro-needling can be performed at grades ranging from superficial to deep. More aggressive treatment doesn't always give you a better result. This is why you need to consult with a professional about your particular skin problem skin type etc. The deeper the procedure, the more downtime you will experience. There are definitely going to be side effects such as redness, swelling, some initial micro-scabbing etc. It takes between 3-6 treatments spaced 4-6 weeks apart to see results and skin should continue to improve over 2 years following the treatment. The most popular devices nowadays are the dermaroller and the dermapen. The derma roller has slopped/ curved insertion of the needles and it is more likely to create tears in the tissue. Dermapen's needles go into the skin vertically so they are less likely to cause unnecessary injuries. My wonder estheticians Maxine and Ashley put up a list of safe make up for our acne prone customers . Wearing non-comedogenic makeup is crucial, as we don't want you to obstruct your skin clearing process. If you have another one in mind please check it for pore clogging ingredients before you use it.